You deserve a smile you feel proud to show off in any situation. At Niagara Peninsula Orthodontics, our mission is to help you achieve this smile on your own terms. As a leading orthodontist serving St. Catharines, Beamsville, Fonthill, and Niagara Falls, ON, we're proud to provide a wide range of orthodontic treatments, and we strive to customize treatment to suit each patient's unique lifestyle. Braces are still the most popular treatment we offer, but if you're looking for a convenient, discrete form of treatment, Invisalign may be right for you. Invisalign is an exciting alternative to traditional braces that uses a fundamentally different mechanism to move and straighten the teeth. Instead of the metal brackets and wires used by traditional braces, Invisalign relies on a series of clear, removable trays called aligners that fit directly over the dental arch. Invisalign aligners are made from a transparent polyurethane plastic material, which makes them almost invisible while wearing. Because the aligners are removable, it's easy to pop them in and out to eat, drink, brush, and perform oral hygiene– making Invisalign one of the most convenient orthodontic options on the market. Virtually Invisible: Invisalign aligners are clear and lay flat on the teeth, which makes them nearly impossible to see when worn. No more worrying about braces in pictures, at social events, or during professional presentations! Enjoy Your Favorite Foods: While braces require you to modify your diet in order to avoid harming your braces, getting Invisalign means you'll simply pop your aligners out during meal time. Whether you want to dig into pizza, popcorn, or a chewy caramel, Invisalign lets you enjoy all your favorite foods! Improved Comfort: The metal brackets and wires of braces are notorious for poking and prodding, which can cause small cuts to form inside the mouth that can be a nuisance. With Invisalign, though, this isn't an issue. The aligners are smooth to the touch, making for a more comfortable treatment experience. Grinding Protection: Because the aligners cover the chewing surfaces of the teeth, they provide a small layer of protection against nighttime clenching and grinding. This can prevent excessive wear & tear as well as ease muscle tension in the jaw. During your initial consultation at one of our offices in St. Catharines, Beamsville, Fonthill, and Niagara Falls, our orthodontist, Dr. Neeraj Pershad, will perform a comprehensive orthodontic evaluation, taking diagnostic measurements like X-rays to fully understand your orthodontic condition. Dr. Pershad will review these results to make a diagnosis. Based on that diagnosis, Dr. Pershad will construct a 3D model of your mouth using advanced computer software, then use that model to create a detailed treatment plan. We will then have your personalized set of Invisalign aligners custom-manufactured based on your treatment plan– as few as 12 or as many as 48 pairs. Once you get your aligners, you'll wear them for 22 hours per day, removing them only to eat, drink, brush and floss. You'll wear each set of aligners for about 2 weeks before moving onto the next pair, and with each new set, your teeth will move closer to their final positions. Once you finish your final set of aligners, you'll have a gorgeous new smile to call your own! We can create aligners with specialized "eruption tabs" that hold open space for unerupted teeth, allowing us to use Invisalign for patients whose molars haven't fully grown in. Each aligner comes with a built-in "compliance indicator," helping doctors, parents, and teens themselves see if they're wearing the aligners diligently enough. Every Invisalign Teen treatment course comes with 6 free replacement aligners, so there's no need to worry if any are lost or broken. 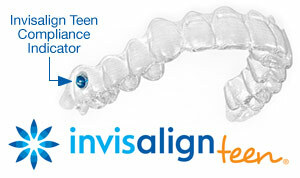 Caring for Invisalign aligners is easy. Simply brush them gently with a toothbrush each time you remove them or put them back in, then rinse them off with lukewarm water. Make sure to never use hot water on your aligners, as this can warp the plastic and ruin the aligners. For a deeper clean, you can periodically soak the aligners in a glass of water with a denture cleaning tablet. When we give you your set of aligners, we'll also provide more detailed instructions for how to clean and care for them. Schedule a Consultation for Invisalign in St. Catharines, Beamsville, Fonthill, and Niagara Falls! Invisalign is a convenient, comfortable, and virtually invisible orthodontic treatment option that can treat the vast majority of orthodontic conditions. If you think Invisalign may be right for you, we'd be happy to help. Reach out to us at our contact page with any questions you may have about Invisalign, or if you're ready to start the process, simply request a consultation online at our Fonthill, Beamsville, St. Catharines, or Niagara Falls, ON office. We can't wait to hear from you, and we're excited to help you achieve the smile of your dreams with Invisalign!